Swim Lane diagrams are used to document and visualise processes in and between organisations. Mapping out the steps that groups / departments undertake can help to identify problems and areas of inefficiency. 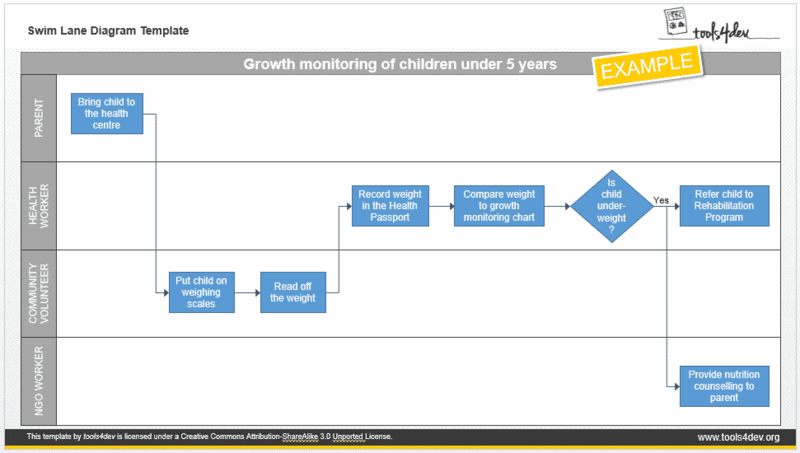 This simple Swim Lane diagram template can help you visualise processes in your organisaiton. The process that you want to visualise is particularly complex or involves a large number of actors/groups (you’re better off to break down the overall process into smaller sub-processes). Your organisation already has a template for documenting and visualising processes. The Supervision Checklist Template by tools4dev is licensed under a Creative Commons Attribution-ShareAlike 3.0 Unported License. All other content is © tools4dev.